Ever since discovering that Saul Alinsky‘s organizing tactics were being taught as the way, the truth and the light in our nation’s schools of social work, I have been encouraging Americans to educate themselves by reading Rules for Radicals. Not only have I written personalized stories detailing accounts of my conflicts with professors, over their teaching such trash to a clueless group of kids, I have written several that have described the extent in which organizers are willing to lie, cheat and steal to get their fabled “state run utopia.” Community organizers are essentially “change agents,” and they are trained to do little else except inflame the passions of the ill-informed and those that believe they are being treated unfairly. If a population can be convinced they are being oppressed, they can be brought to do the bidding for those who promise to liberate them. We see this being played out on a massive scale with the “white privilege” lie currently plaguing our nation. Recently, even Ben Carson has publicly recommended Americans read “Rules for Radicals” while on the Glenn Beck program. Ben Carson is being encouraged by many to run for President, and I believe in many ways he could be great. America certainly needs a black leader who is free to speak their mind as opposed to being enslaved to government dependency. America needs a black leader who espouses patriotism; however, Ben Carson’s stance on semi-automatic weapons makes him ineligible to be president, so please stop asking him to run. 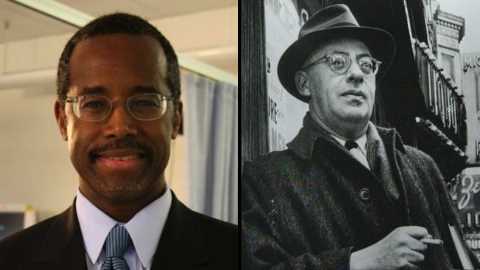 To be honest with you, knowing what I know about Alinsky tactics, I wouldn’t be surprised if Carson is working for gun control advocates and positioning himself to be president by “working within the system.” By encouraging Americans to read “Rules for Radicals,” he makes himself appear as being on the “right” while his opinion on gun control obviously puts him on the “left.” To be fair, maybe this is why he won’t run for President. Could I be a whacked out conspiracy theorist? Perhaps, but these are his own words concerning the 2nd amendment, not mine. If there is one thing I know about “social change” and the idea of being a change agent, it is that these people are incredibly patient, and slowly, but surely, they work on your subconscious to get you to accept change. Ben Carson, besides his stance on guns, appears for all practical purposes to be the antithesis of Obama. He is patriotic and an advocate of free market medicine. He’s successful and he cites the virtues of liberty as being the reason for his success. Perhaps in having such a man as president Americans can be brought to accept a different view on gun control, in exchange for all the patriotism he brings to the table. This is the way Alinskyite’s think folks. This is working within the system. This is getting people to accept what they normally wouldn’t by destroying their confidence in the system. Ben Carson is beside the point folks. I started this article with the intent on focusing on the scandals while briefly mentioning Carson, but I digress. Looking at the quote, at the top of the page, puts everything we are currently witnessing in this country into greater perspective. America, these scandals are designed to get us to lose hope and accept something different. They are designed to keep us disinterested, overwhelmed, frustrated, lost, without hope, and frankly, make us feel “sick and tired” of hearing about it. This is why President Obama always refers to our “Founders” and our Constitution as a system that prevents him from acting. He is attempting to get the people to view his policies as being reasonable, while presenting the Constitution as something that stands in the way. In fact, in the audio file below, he calls the constitution a charter of “negative liberties” which describes too much what the government can’t do to you instead of what government must do on your behalf. All of this summarizes the basic belief of the left wing in this country, and that is that people are not capable of self-governance and we must have government, a body of an enlightened elite, dictating how we live our lives for own good. Our entire infrastructure has been infiltrated by people who are implementing this “change strategy.” For years, our education system has been teaching people that capitalism is the engine of oppression that has enslaved the world, while hardly mentioning any more, the 160,000,000 murdered by leftists in pursuit of utopia. If you ask a young high school graduate what communism is they are likely to respond by saying; “The highest, most evolved form of economics where production is controlled by government to ensure total equality among the people.” In the same breath, you could ask them who Mao Tse Tung was and they would be clueless. This is the result of Alinsky tactics which are designed to get people to lose hope in the current system, and accept change they normally wouldn’t accept. Sadly, judging by the state of the nation today, I would have to say these tactics have been immensely successful. It appears that millions upon millions of Americans have failed to live by the words of Thomas Jefferson as they are surrendering their liberties for false promises of security. Soon, and it’s not that far off, they will discover they have been left with neither. David Risselada is a freelance writer and researcher. David served in the United States Marine Corps from 1995-1999 and the US Army from 2001-2006. In addition to contributing to FreedomOutpost.com, he writes at Radical Conservative. Follow David on Twitter.